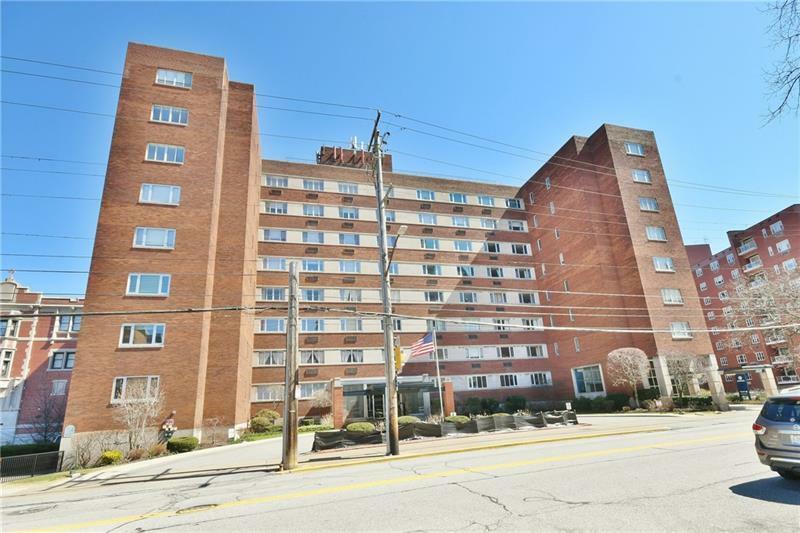 Desirable location with walking distance to CMU, U of Pitt, UPMC, museum, park and eateries. This sizable end unit offers an updated kitchen, new windows, wood floor and most of all, a lovely view. Unit has much natural lights shining through the new insulated windows. The updated kitchen has granite counter top and lots of cabinetry. Master bedroom has a nice size build in closet and master bath. At 9th floor level, it offers a magnificent view. On top of spacious in-unit storage, this unit has extra oversize storage space across the unit. Building also has a roof top patio with grill for outdoor enjoyment and offers lovely view of Oakland area, historic landmarks and buildings. This well maintained building also offers parking spaces for a fee, valet parking, building security, guest suite, library, exercise room and security camera. Condo fee includes water, sewer, trash, building insurance, and common area maintenance. Owner pays for cable and electric only.